LogMeIn Free is gone, but don’t panic: You can find alternative remote-access tools that cost the same low price of nothing at all. Whether you need to access a document, collaborate with a colleague, or support several PCs, try one of these free tools to get back into the game. I’ve been using TeamViewer for years to help out family and friends, and it has always been reliable. Simply download the program from the company’s website, and then install it (or run it without installation, if you desire) on both of the PCs you want to connect. During installation, you can also set the program for unattended control. TeamViewer gives you easy, secure remote access to multiple computers. For ad hoc use, simply run the program and log in from the controlling computer. The two components will connect, and up will pop a window containing the desktop of the computer to be controlled. 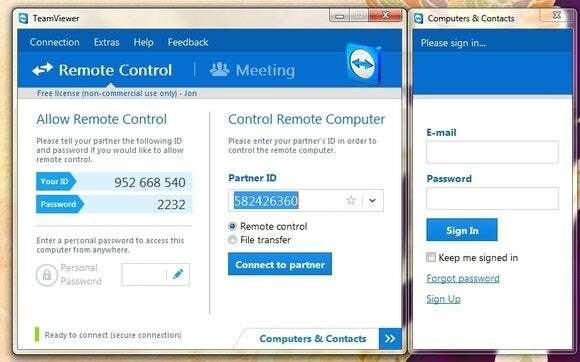 TeamViewer installs as both a server and a client, so you can use it to take control or to allow control. TeamViewer 9’s cooler features include the ability to open multiple remote sessions in tabs (as in a browser), cut and paste between computers via the clipboard, and drag and drop files from your desktop to the remote desktop. It’s a mature, stable, practical tool for anyone’s remote-control needs. Note that you’ll get the occasional message about upgrading to the pay version if you use TeamViewer regularly to connect to a lot of different PCs. You’re on your honor for that one. Although Windows Remote Desktop doesn’t support true screen-sharing (the screen of the controlled computer goes black instead of staying live) the way services such as Join.me and TeamViewer do, this built-in tool is free and fast, and it allows complete remote control over PCs. There’s even Microsoft Remote Desktop for the Mac, so you can remotely access your more artistic acquaintances’ Apple products. Don’t underestimate the power of Windows’ built-in remote-connectivity tool. The basic concept behind Windows Remote Desktop is to let users control their office computer remotely so that they can work from home. Hence, although all versions of Windows (Basic, Home, and so on) can establish a Remote Desktop connection and control a PC, only the Professional, Business, and Ultimate versions of Windows can be controlled. As most office computers are one among many on a network, you need to have the office router tweaked to forward a port (3389) to the PC you want to control. You can edit the Registry to allow control of more than one PC by adding more ports, but that’s a very techie task. 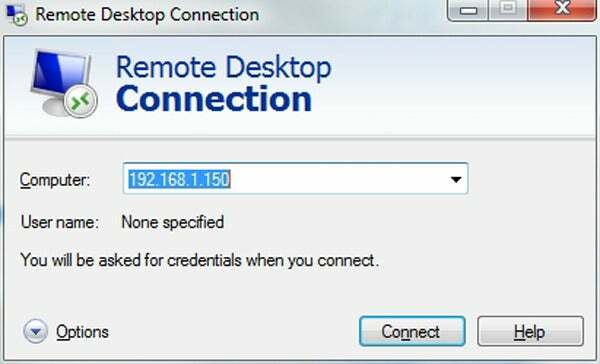 Windows Remote Desktop works great once you’ve set it up, but if you want to control multiple PCs on a regular basis, the next option might be better for you. VNC, or Virtual Network Computing, isn’t itself a product, but an open-source remote-control and display technology that’s implemented by Tight VNC (free), Ultra VNC (free) and RealVNC (free and pay), among other parties. VNC isn’t hard to use, but it’s not as simple as Join.me and TeamViewer, which don’t require user knowledge of IP addresses. 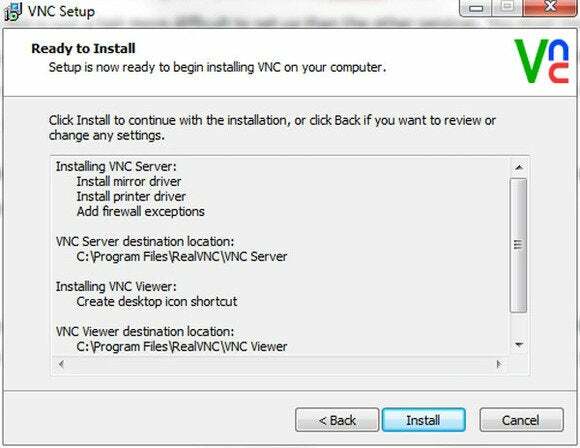 VNC is a good option if you need to control multiple PCs regularly. To use VNC, install it on both the PCs you want to connect and then set them to listening. To control another PC, simply open the VNC viewer (client), enter the PC’s IP address, and have at it. You may also have to open port 5900 on your firewall and router, and to direct said port to the PC you want to control. You can use VNC to connect to multiple PCs behind a public IP by opening and using more ports. Most VNC implementations install both the server and viewer software by default, so (as with TeamViewer) you can control in either direction. Though it’s a tad difficult to set up, VNC is cross-platform (Windows, Mac, Linux), and it works extremely well once installed. 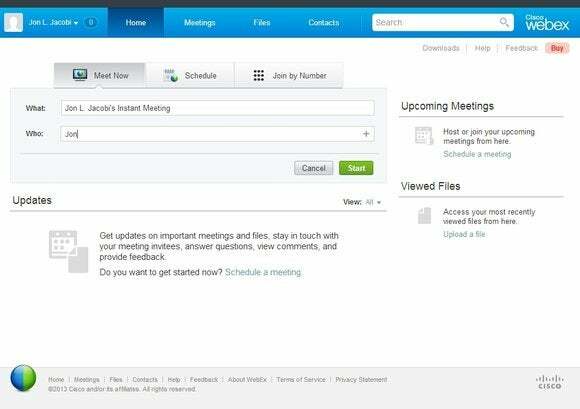 Join.me is a meeting service (free and pay) from LogMeIn that also provides remote control. It’s convenient for impromptu support in that all you need on the controlling PC is a Web browser. The user with the computer that will host the meeting (and offer control) simply surfs to the Join.me site, selects Start Meeting, and downloads a file. 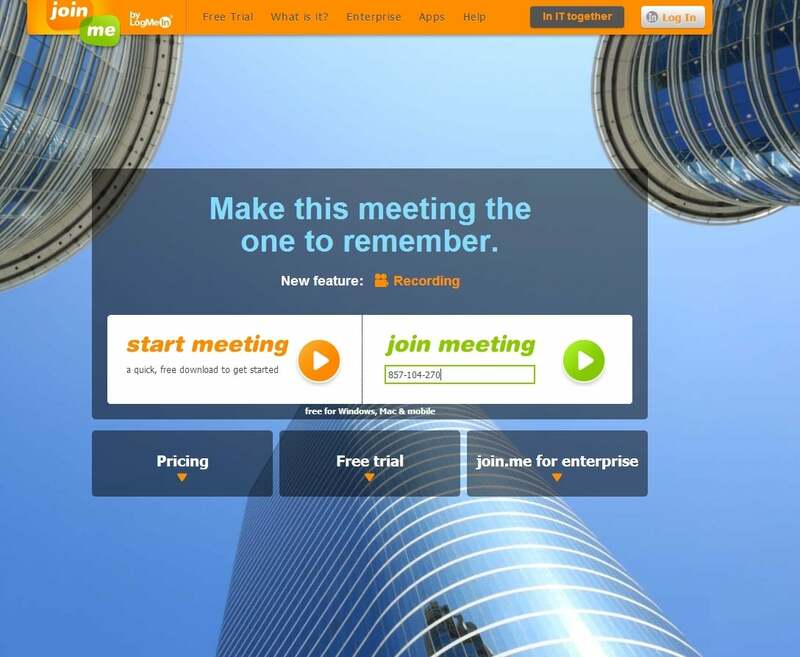 Meeting service Join.me also offers remote access—all you need is a Web browser. After running said file, the meeting originator passes the provided nine-digit passcode to the user or users on the other end, who in turn enter the passcode in the Join Meeting field on the Join.me homepage. The meeting originator’s desktop will appear in the browser. Once remote control is granted, you can chat, send files, and more. Easy-peasy, but note that Join.me isn’t suited for unattended remote control, which makes it only a partial replacement for LogMeIn. Most users think of WebEx as a tool for multiuser boardroom meetings, but it’s also perfectly suitable for small-scale, live (not unattended) remote control and support. WebEx works a little differently from Join.me in that installing software is required at both ends, but that’s a relatively painless procedure. WebEx: Not just for multiuser meetings. 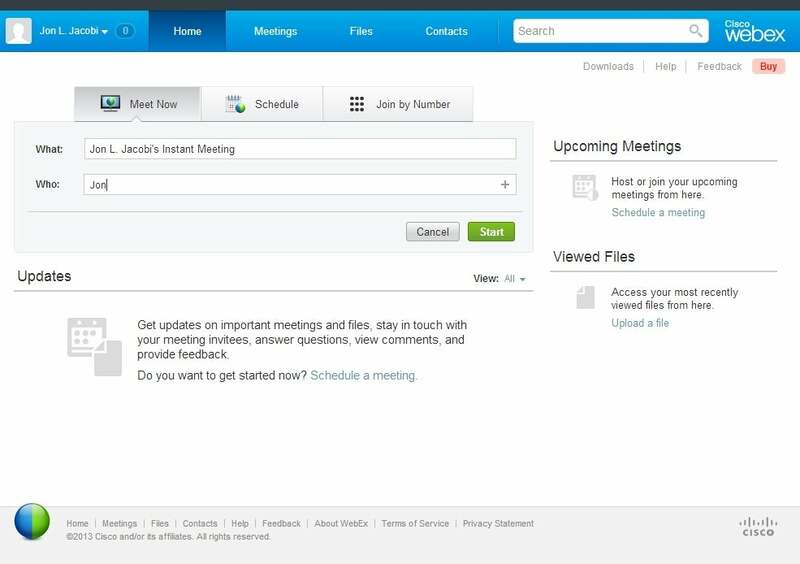 Once users have joined the meeting, initially they can only view the originator’s desktop, but the originator can make another person the presenter, pass control over the mouse and keyboard, and share files, chat, and utilize webcams for face-to-face interaction. There’s a bit of a learning curve if you stray from the main features (available from the usual drop-down panel at the top of the display), but overall WebEx is quite easy to use. Because of the popularity of remote-control and remote-meeting services, the Web is rife with spoof sites (those that look very much like the correct one, but aren’t) that will attempt to lure you in if you don’t type the URL correctly. Downloading software from these sites can be dangerous to your computer’s health, as well as to your wallet. Sometimes the bad guys will try to sell you support. Thanks to the growth in distributed and mobile workforces, the ability to access and control a PC remotely is a must for workers and IT administrators alike. That’s why we’ll all miss LogMeIn Free. But if you really love one of these free alternatives, consider throwing a few bucks to the developer. Who knows: Your contribution could help to keep the program going for everyone.